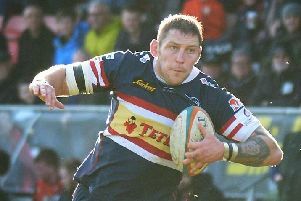 Doncaster Knights will hoping to make amends for their worst home performance of last season when they entertain Greene King IPA Championship rivals Jersey today (2.30pm). Knights were in the middle of a run of nine successive league defeats when the Islanders last visited Castle Park, but they are currently flying high in third place and are confident of putting them to the sword. Not that Knights boss Clive Griffiths will be taking Jersey for granted. “It’s been a funny start to the season with Bedford currently holding down top spot and playing some good stuff and throwing the ball about,” he said. “Moseley, who were probably everybody’s favourites for the drop - have six points from two games on the road. “It seems any side can beat everybody else at the moment and it’s all on the day. “It’s early days and we picked up another couple of injuries at Nottingham on Sunday and we’ve still got things to work on. “Whilst I’m happy with our attacking play, and we’ve been playing some entertaining stuff, when you play like that you always leave yourselves open a little bit and that is why we’ve let in more tries in our opening games than we’d like. “Having said that we completed 92 per cent of our tackles which was up from the London Welsh game and we are looking for an even better performance this weekend.